"I have been beaten, and I recognize my defeat: I have surrendered to the Lord and have come to supplicate him" (Gr. Naz. Or. 2.1). With these words Gregory the Younger of Nazianzus begins his second oration, delivered probably on Easter 363 and circulated soon thereafter. This oration represents the earliest systematic treatment of the Christian priesthood propagated by a member of the Greek-speaking Roman elite. Gregory's treatise on the nature of Christian leadership had a profound and lasting impact, for example on John Chrysostom, another member of that elite and bishop of Constantinople. Chrysostom's work on the priesthood, based on Gregory's, then influenced another bishop in an imperial residence, Ambrose of Milan, through whom it gained purchase in the West. Rufinus's Latin translation of Gregory's oration influenced Western writers directly, including Augustine and Jerome, who had heard Gregory speak in Constantinople, as well as Paulinus of Nola and Julian of Eclanum. Gregory the Great's work on the priesthood also reflects his acquaintance with Gregory of Nazianzus's, gained either during the former's stay in Constantinople or through Rufinus's translation. In sum, Gregory's Oration 2, On the Priesthood, became immensely influential in the East and permeated the Western tradition. But in 363 this was all in the future. When Gregory spoke the opening words (or words very similar to those he chose to preserve for posterity), he had just returned to his ancestral city of Nazianzus from a sojourn at Annesi, a small village in Pontus where the family of his friend Basil, later bishop of Caesarea, owned an estate. Ostensibly, his departure and return are the key themes of the second oration. Given its length, however-117 chapters-we can surmise that Gregory's reasons for leaving and coming back were complex. Indeed, they range from his own affairs to those of the oikoumen? of the Romans and to the very cosmos and its genesis. All these reasons, personal, local, and the global and cosmic, were seamlessly intertwined in Oration 2, the principal focus of Part II of this book. But not only in Oration 2. Gregory in all his writings from the early 360s-that is, his first six orations-formed a densely woven tapestry that included the same elements, from the personal to the cosmological. These orations were composed like an instrument with many different strings (to use his own intertextual metaphor), each one activated at appropriate moments but all sounding together in harmony as a comprehensive whole. As such these six orations contain the nucleus of Gregory's interpretation of the nature of the divine; its relation to the sensible, material world; and the consequences of that relation for humans seeking to guide others toward the divine. In these orations Gregory delineates which persons had been divinely entrusted to lead mankind and how they ought to comport themselves to approach the divine so that they could lead others to it. In short, these orations are the foundational work that made Gregory "the Theologian." Gregory formulated most of these concepts in Nazianzus, and they were in the first instance intended for a local audience. But Nazianzus was not an island. Gregory's thoughts and positions engaged some of the most intense debates then gripping men of the Greek-speaking elites of the Eastern Roman Empire and reverberating among their Western contemporaries. These debates revolved around the nature of the divine and its interaction with the material world and humanity, crystallized in the way in which the divine was thought to speak to humans. How the divine and these interactions were understood affected the qualities considered necessary to lead the oikoumen? and its inhabitants to salvation. To understand Gregory's second oration and its impact we need to know first what the state of the debate was in the late 350s and early 360s. Who were Gregory's contemporaries, and what were they debating in the 360s? How had these debates evolved in the preceding decade, and why did they matter? And who was Gregory of Nazianzus? "I, Diocaesarea, am a small town." Gregory's description, placed rhetorically into the mouth of his native city, was certainly accurate. Diocaesarea, Nazianzus in the native tongue, was a small town. In western Cappadocia, however, a small town was not necessarily insignificant. Diocaesarea, like Caesarea, Tyana, and Archela∩s, actually had municipal or city status, in a region exceptional for its lack of such cities. Diocaesarea-Nazianzus's territory, the Tiberine, was considerable. It included Venasa, some fifty kilometers to the north; Karbala, about ten kilometers south; and Sasima, twenty-five kilometers east. Furthermore, it was located on one of the major west-east routes of the empire, linking the imperial residences Constantinople and Antioch, a route Ammianus described as the usus itineribus solitis. It passed from Antioch to Issus, Mopsuestia, and Tarsus, and then crossed the mountains at the Cilician Gates to descend to Tyana, passing via Sasima and Nazianzus to Ancyra and then Constantinople. In fact, the only mention of Nazianzus prior to Gregory's occurred in two itineraries designating it in Latin either as a "mansio Anathiango" or as Nandianulus. Nazianzus was (or, rather, parts of it were) indeed a mansio (Greek mon?) or stathmos, a posting station between Archela∩s (Civitas Colonia) and the next mansio on the main highway between Constantinople and Antioch, the said Sasima, twenty-four Roman miles distant. As a mansio, Nazianzus was equipped with inns offering "meals and sleeping quarters; [a] change of clothing for the drivers and postilions; [a] change of animals [stabling as many as forty horses, mules, or both], carriages, and drivers ...; grooms ...; escorts for bringing back vehicles and teams to the previous station ...; porters ...; veterinarians ... [and] cartwrights." Mansiones had to accommodate ordinary travelers passing through, all those who held permission to use the cursus publicus, and the large imperial traveling parties. Numerous inscriptions and literary sources attest to the effort and personnel an emperor required as he moved across his realm. During the late 350s and the early 360s, imperial travel between Constantinople and Antioch was especially frequent, because Antioch was the traditional staging place for Persian campaigns, and the size of the entourage only increased when the emperor was en route to a military campaign. Thus, while neither a Caesarea nor an Archela∩s, Nazianzus was no isolated hamlet. A polis with a mansio on a major route traversed by the imperial court, numerous public officials, and other men of letters, Nazianzus had regular contact with the wider world. Although Gregory had reason to refer to Nazianzus-Diocaesarea as insignificant, such a characterization was also a well-known rhetorical topos. Authors who considered themselves members of a well-established provincial elite expressed pride in their ancestral cities in rhetorical formulations that, paradoxically, stressed their very insignificance. Thus Plutarch, Aelius Aristides, and Galen, like Gregory, frequently evoked the smallness of their native cities. The artfully constructed context, however, leaves no doubt that these writers, Gregory included, intended to contrast the insignificance of the city with the importance of the author who hailed from it and whose praise would immeasurably augment its prestige. Indeed, Gregory expressed civic pride through such literary topoi naturally. His family belonged to Cappadocia's landholding elite, and his father had been one of the most prominent citizens (a principalis or leading curialis) of Nazianzus, a rank to which his son could also lay claim. Born around 329 or 330, most likely at Arianzus, one of his family's estates at Karbala located in the hills about ten kilometers south of Nazianzus, Gregory was the older son of Gregory the Elder and his wife Nonna's three children, Gorgonia, Gregory, and Caesarius. Arianzus was also where he spent the years of his retirement after Constantinople. This and the family's other estates contained vineyards, orchards, and flowering fields, and were pleasant and fertile despite occasional severe droughts. To this Nazianzus Gregory returned in 363. It was not his first return. In 358 or 359 he had come home after nearly a decade spent in Athens in pursuit of higher education. Athens had not been the first stop on his educational journey. Gregory and his younger brother, Caesarius, like most of their social peers, were first trained in grammar at home by a paidag?gos, Carterius, who also accompanied the brothers to the provincial capital, Caesarea, for further training in grammar and rhetoric, probably during the year 345/6. About a year later they proceeded to Caesarea Maritima, in Palestine. This city housed the remarkable library of Origen, continued by Pamphilus and Eusebius. John McGuckin proposed even that Gregory and his brother were sent there because it "was the closest thing in the fourth century to a Christian university town." Indeed, Gregory's stay at Caesarea in Palestine marks a decisive period in modern scholarly accounts of his Christianization. Because of the city's excellent Christian library dating back to Origen, scholars have assumed that Gregory received his first profound introduction to Origen's thought and method as well as to the theological debates then surrounding them, and that the decisive influence of Origen on his later thought began with his sojourn in Caesarea. Scholars support this assumption by pointing to the so-called Philocalia, excerpts of Origen's writings that Gregory supposedly made together with Basil in the late 350s or early 360s. While Gregory probably had contact with the library and its Christian milieu, his scant remarks on his time in Caesarea praise only his pagan teacher Thespesius. Even though Gregory calls him a grammarian, Thespesius was a well-known rhetorician in the tradition of the Second Sophistic, who also counted among his students a certain Euzoius, who would renovate Eusebius's library after he had succeeded Acacius as bishop of the city. Gregory's praise of Thespesius and Libanius's complaint that Caesarea's reputation as a center of rhetorical education rivaled Antioch's suggest that this excellent education exercised at least as much pull as Origen's library (which Gregory does not mention). Still, Gregory may have purchased the excerpts of Origin's writings later known as the Philocalia while he was at Caesarea. But it is important to keep in mind that assumptions about Gregory's immersion in an Origenist milieu at that time, however tempting they may be in explaining his education as Christian, are unverified, notwithstanding Origen's notable influence on Gregory's later oeuvre. After about a year in Caesarea, toward the end of 348, Gregory and Caesarius moved on to Alexandria. Here, the brothers parted ways, Caesarius remaining in Alexandria to study medicine, and Gregory proceeding to Athens, evidently without having met either Didymus the Blind or Athanasius in Alexandria (i.e., again having established no demonstrable connections to the local Christian circles). Gregory arrived in Athens in 348 or 349 and remained there for nearly a decade. He did not fail to record in his later writings the imprint of Athens on his formation, though he said little or nothing of that of either Caesarea in Palestine or Alexandria. "O Athens, the glory of Greece; O Athens, the golden city of learning!" With these words he celebrated his own and Basil's time in Athens many years later in his eulogy for the deceased bishop of Caesarea. As Samuel Rubenson has noted, Gregory's evocation of that city "is the longest extant passage on contemporary Athens in the entire literature of the Patristic period," and certainly not by accident. Gregory left no doubt that he enjoyed his stay at Athens thoroughly and that he embraced and was prepared to defend the "passionate love of letters" that he had deepened in "the golden city of learning." Among those who fostered his passion were the rhetoricians Himerius, as Socrates and Sozomen tell us, and Prohaeresius, as Gregory himself confirms in a later epigram. Himerius, who came from Prusias, in Bithynia, was so famous for his harmoniously poetic style as to be compared to Aelius Aristides. The Armenian Prohaeresius, who had spent time in Cappadocian Caesarea prior to coming to Athens, was famous for his extemporaneous speeches and renowned as a mentor. He was a Christian and as such an exception in Athens and among Gregory's teachers. A certain Priscus, a disciple of Iamblichus, also lectured there at that time, and Gregory may have heard him too. Although Gregory heaped lavish praise on Athens as a center of learning, he was, again, rather reticent about his Christian formation there. A single reference to "our sacred buildings" asserts a preference for these rather than the teachers outside (Gr. Naz. Or. 43.21). Things Christian were not on Gregory's mind when he recalled his time at Athens, except for the preternaturally mature Basil (Or. 43.23). Basil arrived in Athens a few years after Gregory. The two men may have already known each other from Caesarea in Cappadocia, or they may have met in Athens as Cappadocians tending toward companions and teachers with connections to Cappadocia or at least Asia Minor. In any event, in Athens the two became "all in all" to each other, one soul in two bodies, sharing room, table, and all their days and nights (Or. 43.19). In Athens both men also made a momentous decision: to cultivate excellence or virtue (aret9) with a twist. "Philosophy was the object of our zeal," as Gregory would later say (Or. 43.19-20), though exactly what he meant by that will occupy us for much of the subsequent chapters. For now it suffices to note Gregory's recollection that he and Basil had already in Athens attempted to combine the goal of philosophy with a Christian formation, basing their attempt solely on the scriptures and each other as inspiration and "measuring rod" (Gr. Naz. Or. 43.17-22). To have at hand a collection of excerpts from Origen's writings on questions such as the nature of free will and "the divine inspiration of the divine scripture, and how it is to be read and understood; and what is the reason for the obscurity in it, and for what is impossible in some cases when it is taken literally, or what is unreasonable," may well have been of great value in this endeavor, which would further support Neil McLynn's suggestion that Gregory had purchased such a collection at Caesarea. As he points out, the Philocalia, which throughout suggests an individual approaching the divine writings without reference to institutional settings such as a teacher or a community, would have been ideal for such enterprising students as Gregory and Basil. Gregory and Basil were not alone in these experiments. Gregory's connections to men such as Sophronius, eventually a magistrate (magister officiorum) at the court of Valens in Antioch and then prefect of Constantinople; Eustochius, a future professional rhetor at Caesarea; Hellenius, eventually equalizing the taxes at Nazianzus (as peraequator); Julian, another tax assessor responsible for Nazianzus and perhaps also praeses, or governor, of Phrygia; and Philagrius, a fellow student of Caesarius, all date back to his student days. These friendships were forged, according to Gregory's later reminiscences, in an atmosphere of intense rivalry and correspondingly tight-knit groups of like-minded students, a brotherhood based on common geographic origin and further enhanced by allegiance to specific teachers, often with the same regional background, who "initiated" their flock to the Muses (Or. 43.22). Rivalries between such brotherhoods involved public displays of individual aret9, which was understood as the capacity to endure blows, to devise appropriate rhetoric to accompany such skirmishes, and to maintain face on all occasions. For those who trained in Athens, such public displays gained from the opportunity there to reenact the famous bouts of a Demosthenes or Callimachus at the very site-a heady experience, no doubt, even for someone like Gregory, who had learned, as he later claimed (in the process of establishing once and for all his superiority while verbally beating his opponents to the ground), to sublimate his competitive streak through his desire for the philosophical life (Or. 43.20). Competition in public and between close friends such as Gregory and Basil was an essential feature of rhetorical training; after all, those who received such an education had to learn how to confront as well as collaborate with each other, and with those ranking above and below them in the public forum of the empire and its administration. Indeed, while Gregory and Basil's decision to search for ways "to become more pleasing to God" (to use words attributed to Libanius in his correspondence with Basil) did not represent a common path for young men of their background and education, both men began after Athens to do what Gregory's friends did-to become professional rhetoricians, advocates, and public officials. As Gregory's later autobiographical writings and letters exchanged after Basil's return to Cappadocia in the mid-350s and Gregory's about three years later confirm, Gregory in fact engaged in the profession of rhetorician more decisively than Basil. Although Gregory makes scant reference to how he spent his time upon returning to Nazianzus around 358, his letters and his autobiographical poem De vita sua reveal that he instructed students "in the Attic training" and had "shown off logoi" and "danced for friends." There is little doubt among scholars that Gregory became a teacher of rhetoric. It is very probable, however, that he held that position longer than the few months or one year that have usually been assumed, at least until his ordination in late 361 or early 362 and potentially even to mid-363. Gregory's social status and that of his family support this probability. As members of the curial class, Gregory and his father were affected by the complex and improvisational imperial legislation regulating curial exemptions and membership in the clergy. As mentioned, Gregory the Elder had been among the principales, the leading curiales of his city, prior to becoming a bishop. He retained his properties and upon his ordination, at least according to a law issued in 349, his privileges and his fiscal responsibilities would have devolved upon his sons. Caesarius, who had returned to Nazianzus at the same time as Gregory, took a highly popular route to escape these responsibilities: he moved up the social ladder and on to Constantinople and a position in the senate there (Gr. Naz. Or. 7.9). Gregory as an Athens-trained rhetor pursued another proven method to alleviate his and his family's fiscal burdens: for any city would happily have granted relief from fiscal responsibilities in exchange for boasting such a figure among its citizens, as an enhancement of its status and as an exemplar of its connection to the wider world. Fiscal and other obligations go a long way toward explaining Gregory's moves in the late 350s and early 360s, as reflected in a famous exchange of letters between Gregory and Basil. I return to this exchange in Chapter 6 but sketch its general contours and their standard interpretation here. According to scholarly consensus, by the time Gregory returned to Cappadocia, around 358/9, Basil had already made a start on the philosophical life of retreat that both men envisioned at Athens. Prompted by the example of his younger brother Naucratius, who had just renounced his position as an advocate and rhetor, Basil moved to his country estate, Annesi, to dedicate himself to the pursuit of philosophy. Almost immediately, he began to persuade or to pressure Gregory to join him in that pursuit, in accordance with their plans. Gregory, however, wavered (already in keeping with his scholarly depiction as a labile character), torn between his desire for retreat with Basil and the pressures that his father put on him to remain in the world. "I must confess it. I have gone back on my promise to be with you and live the philosophical life with you as I had promised as far back as our Athenian days. ... One law has won out over another [nomou nomon nik?santos], the one that prescribes care for one's parents [over] that of loving friendship and togetherness." While these letters appear to corroborate the scholarly characterizations of the protagonists, with Basil steadfast and committed and Gregory wavering and tormented, in fact Gregory himself later chose and edited his own letters together with Basil's responses, presumably to present to posterity a cameo of a forceful Basil and a deliberating (or wavering) Gregory, carefully examining his options and obligations as early as the late 350s and the beginning of the 360s. And he may well have had reasons for shaping his own historiographic persona as well as Basil's in this manner. "May we forgive each other, I who have been the victim of this beautiful tyranny ..., and you who have exercised this beautiful tyranny upon me." However attractive the idea of the retreat (apragmosyn?) 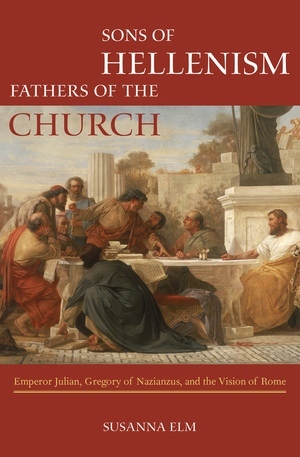 in Pontus may have been, however sweet and powerful the bonds of friendship, Gregory, as his own preserved contemporary writings make clear, wanted it known that between 358 and 363 the duty to serve one's parents was paramount. He had in fact joined Basil at Annesi for a brief period before being called back by the laws circumscribing the duties toward his parents and his city, and the specific requirements that they placed on him at that moment. In the event, Basil's philosophical sojourn at Annesi did not last long either. By late 359, Basil had left Annesi, first for Constantinople and then for Caesarea, and Gregory was in Nazianzus, teaching as a rhetorician and "dancing" his Attic training for his friends. To appreciate fully what this position and his duties to his father entailed, however, it is necessary to step back in time and outwards geographically, to retrace what other than curial obligations were at stake for Basil in Constantinople and for Gregory and his father in Nazianzus in the late 350s and early 360s: it is time to place the personal and the local into the wider context of the oikoumen?. With the defeat and subsequent suicide of the usurper Magnentius at Mons Seleuci in the Alps in August 353, Constantius II, the son of the Divus Constantinus of iusta veneranda memoria, became the sole ruler of the empire, the first since 337. Constantius immediately began to focus on the task that was his by right of inheritance as well as military superiority: to consolidate and secure a united orbis Romanus. As sole Augustus, he immediately offered amnesty to the usurper's followers and even to members of his family and some close friends, and issued new coins to spread the message of a unified realm as quickly as possible. These coins signaled that while Constantius II was now Augustus of the entire realm, the East, where he had grown up and where he had ruled since 337/8, was to be the model. In the East Constantius had labored most to secure the oikoumen? against the aggressive Persians under Shapur II. Most of his trusted friends hailed from the East. He had, moreover, lavished much attention on monuments that showcased Constantinople as the new capital, and it was only appropriate that for him the New Rome now equaled the first Rome as the gloria Romanorum and gloria rei publicae. Constantius had paid dearly to suppress the rebellion of the Frankish officer Magnentius, and before him that of a certain Vetranio. While Magnentius's usurpation had not been the first attempt to seize the throne, it had been the most dangerous, not least because in 350 Magnentius had murdered the Western Augustus, who was Constantius's sole surviving brother, Constans. The situation had been further destabilized when the Danubian army elevated its commander, Vetranio, as Augustus on March 1, 350, a second usurpation in short sequence. Constantius learned of these events while in Edessa, engaged with the Persians under Shapur II, and moved west after entrusting the ongoing engagements to Lucilianus, who eventually defeated the Persians. On December 25, 350, the Danubian army, apparently after an eloquent display of diplomacy, joined Constantius's cause, and Vetranio elected to retire. That left Magnentius and the Persians as the principal foci of Constantius's attention. To regulate matters in the East while engaged in the West, Constantius elevated his cousin Gallus, the son of his stepuncle Julius Constantius, as Caesar of the East on March 15, 351 (in the presence of bishop Theophilus the Indian). Constantius married him to his sister, Constantia, and dispatched Gallus to the imperial residence at Antioch. Magnentius reacted by also elevating one of his own relatives to the rank of Caesar and by withdrawing troops from the Rhine in order to march against Constantius. The ensuing battle at Mursa, in September 351, proved among the most costly of the time. Magnentius was finally beaten only in the summer of 353, and on October 10, 353, Constantius could at last celebrate his sole rule. The new totius orbis dominus took up residence in Arles, but he could not ignore the affairs of the East in favor of those preoccupying him in the West. Gallus had not proved a felicitous choice. A food crisis that affected Antioch in particular-an economic and social challenge notoriously difficult to handle-had evidently overtaxed Gallus's leadership abilities. According to Ammianus, who was, however, ill disposed toward him, Gallus had fatally alienated the local curiales by accusing them (apparently with good cause) of speculative hoarding and had further instigated the populace to murder the consularis Syriae, activities Constantius could not ignore. Toward the end of 354, Gallus was executed. In the meantime, Constantius had to move further west in early 354 to restore order on the weakened Rhine frontier, managing to do so again by means of diplomacy. He spent the winter of 354 in Milan, henceforth his residence and staging ground for his Western campaigns along the Rhine until he moved east, first to Sirmium and then to Constantinople in 357/8. While in Milan, Constantius entrusted Silvanus, master of infantry and a Frank, with the command of the Rhine army. Alas, Silvanus, evidently the victim of an intrigue, found himself forced to revolt in August 355 and was executed soon thereafter. Now Constantius requested that his sole surviving male relative, Flavius Claudius Julianus, his cousin and Gallus's half-brother, at that moment engaged in advanced studies in Athens, come to Milan and accept the mantle of Caesar. Julian was appointed Caesar on November 6, 355. He presented his Augustus and cousin with a panegyric that reflects his awareness of the enormous responsibility now placed on his shoulders as the second most powerful person on earth. To be a scion of the house of Constantine was a natural advantage, Julian conceded, but did not suffice to ensure the qualities of a ruler. (See Gallus's example.) That a natural aptitude had to be combined with strict discipline the excellent example of the Augustus demonstrated and the new Caesar understood perfectly well, as indicated by his inaugural speech. Newly married to another of Constantius's sisters, Helena, Julian left for Gaul soon after his acclamation. Constantius remained in Milan until he concluded new treaties with the Alemanni in 356, whereupon he proceeded east to Sirmium in early 357. The actions briefly outlined above provide a framework for Constantius's principal duties as sole ruler and scion of the second Flavian dynasty: the defense and consolidation of the inheritance of the divus Constantinus. Unification of the realm and the securing of its frontiers were paramount in these endeavors. To do justice to Constantius II, the man and his rule, is, however, no easy undertaking: our chief narrative sources present sharply divergent pictures. Constantius is praised as erudite and just or condemned as boorish and cruel; characterized as generous, courageous, capable, and moral, or as feebly aping Constantine, a mere plaything of his eunuchs, wives, and courtiers. Two general tendencies account for such starkly opposing variations of the panegyric themes. One is the Julianic strand of contemporary writings, including Ammianus's work, in which Constantius becomes the negative foil for his successor Julian, representing the polar opposite of all Julian's outstanding qualities. The other strand-or, better, strands, both positive and negative, are represented by persons directly affected by Constantius's own rule and his imperial wish to consolidate his realm, namely leading Christians. Phrased differently, as in the case of every new emperor, Constantius's accession and his efforts to consolidate the empire meant realignments among those with access to the ruler. Loyal men, mostly Easterners, were honored with favors and signs of imperial benevolence (philanthr?pia), while others suffered the consequences of his displeasure: execution, exile, removal to their homes, and more or less voluntary retirement. In both groups, those with access and favor as well as those demoted and removed, were Christian bishops and their advisors, some of whom wrote their Constantius for posterity according to the treatment they and their friends received at his hands. Here, an important historiographic strand clustered around Athanasius, bishop of Alexandria, and his supporters, who had been among those removed, and whose portrayal of the emperor was correspondingly unfavorable, to put it mildly. The combined balance of the Julianic and Athanasian historiography was, hence, negative. Moreover, the Christian historiographic tradition that was positively inclined toward Constantius and opposed to Athanasius was declared heretical after 381, and survives only in fragments. Not surprisingly, this overwhelmingly negative portrayal of Constantius in the surviving and easily accessible narrative sources has dominated his modern scholarly assessment as well. Recent research, however, is redressing this picture, and the chapters that follow seek to contribute to that redress. Nevertheless it is possible to reconstruct, with fair accuracy, Constantius's policies vis-α-vis the new religion in his realm, especially those policies that affected persons such as Gregory the Elder of Nazianzus and his son, Gregory the Younger. Among those attending the emperor Constantine the Great during his final moments in Bithynia, in Nicomedia in May 337, was a man who had played an increasingly important role as friend and advisor during the emperor's final years. His name was Eusebius; he was then bishop of Nicomedia, the tetrarchic imperial residence adjacent to Constantinople, and he could draw upon a substantial network of friends, hoi peri tou Eusebiou, who profited as much from his closeness to the emperor as he did from their support. Eusebius is said not only to have been at the emperor's bedside at his death but also to have baptized Constantine just before. More important, if we are to trust the historian Philostorgius, the dying emperor entrusted Eusebius to relate his last wishes to his eldest son, Constantius II, who "alone among his sons ... rushed [from Antioch] to be near him" as soon as he learned of his father's illness-alas, too late to reach him alive. Philostorgius, born in 368 in Borissa, Cappadocia, and writing about a hundred years after these events, has to be counted among Eusebius's friends; he related a version of the events sympathetic to Eusebius, and he belongs to the fragmentary pro-Constantius historiographic tradition. Sympathy was required, because Constantine's succession-the real theme of the incident Philostorgius related-was a famously messy affair very much in need of subsequent interpretation. The details will probably never be untangled. The various interpretations will occupy us in subsequent chapters, but these are the salient facts: Constantine died on May 22, 337, intestate and in the midst of preparing a Persian campaign. In the preceding years, he had devolved increasingly important positions and functions to his sons Constantine II, Constantius II, and Constans, and in addition on his half-brothers and their sons, presumably intending to install a collegiate rule in the tetrarchic fashion, albeit on a dynastic basis. On September 9, 337, however, nearly four months after his death, only his three sons were acclaimed as rulers-Constantine II of most of the West; Constantius of the East; and Constans of Italy, Africa, Illyricum, and Moesia. As a result of, or in the context of, a military revolt in Constantinople and its environs, Constantine's half-brothers and most of their male relatives were dead, among them Julius Constantius, Gallus's and Julian's father. Philostorgius's account reflects the troubles surrounding the succession by relating that Constantine's last wish entrusted to Eusebius was to deliver a letter to Constantius II, voicing the emperor's suspicion that he had been poisoned and urging his son, as his heir, to avenge his untimely death. Philostorgius's account, furthermore, reflects a reality not directly connected to the fateful months of 337: Constantius II as Augustus of the East acted as his father's heir at least insofar as he, too, retained Eusebius as friend and advisor. In characterizing Eusebius's role at this time (337), Philostorgius reflects this friend's subsequent influence at court and also exonerates and legitimizes Constantius II, the emperor who granted Eusebius access and accepted his advice. This groundbreaking study brings into dialogue for the first time the writings of Julian, the last non-Christian Roman Emperor, and his most outspoken critic, Bishop Gregory of Nazianzus, a central figure of Christianity. Susanna Elm compares these two men not to draw out the obvious contrast between the Church and the Emperor’s neo-Paganism, but rather to find their common intellectual and social grounding. Her insightful analysis, supplemented by her magisterial command of sources, demonstrates the ways in which both men were part of the same dialectical whole. Elm recasts both Julian and Gregory as men entirely of their times, showing how the Roman Empire in fact provided Christianity with the ideological and social matrix without which its longevity and dynamism would have been inconceivable. Susanna Elm is Professor of History and Classics at the University of California, Berkeley. She is the author of Virgins of God: The Making of Asceticism in Late Antiquity.